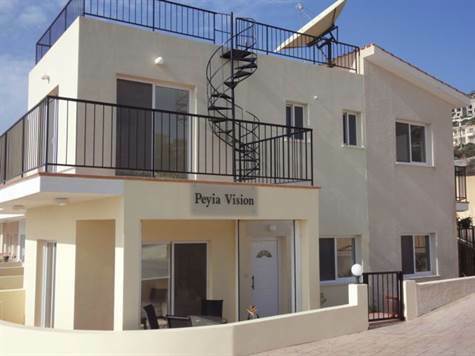 Peyia, Paphos - This impressive 2 bedroom end townhouse with large roof terrace is located in the popular village of Peyia. There are a wide variety of local amenities in the village itself and the beautiful sandy beaches of Coral Bay are a 5 minute drive away. The property has been designed to take advantage of the stunning sea and mountain views, which can be enjoyed from all aspects of the property. On the ground floor is an open plan lounge and dining area with patio doors providing easy access to the ground floor terraces and garden. A guest cloakroom is situated at the base of the staircase and an archway leads through to a large well equipped kitchen with white fitted units, built-in oven, electric hob and extractor fan, fridge/freezer and washing machine. Upstairs are two spacious double bedrooms, both with fitted wardrobes, en-suite facilities and private balconies. A wonderful bonus is the amazing roof terrace, providing additional leisure space to enjoy the breath-taking panoramic views. The plot is low maintenance with gravelled areas to the rear and side. The side garden/patio has a pergola with fitted blinds on two sides providing shade and additional privacy when required. An allocated parking space is situated near the entrance. The property is ideal as a holiday or permanent home and has full title deeds.